All over the world, people have had deep feelings to process with this election. It has taken me close to 48 hours to even begin to write. I have talked with many friends, family and strangers about their thoughts and it ranges from fear to deep sadness. I have not interacted with anyone who is excited or enthusiastic, although I know I live near a big city where there is a Democratic lean. While protesters continue to walk and express their fear and anger, I know that in time it will die down and we'll then have an opportunity to dig deep and more fully understand one another. What is rural America saying with one of their biggest voter turnouts--predominately for Trump? WHAT DO THE PEOPLE OF WISCONSIN HAVE TO SAY? WOW! 32 years of being a Democratic state and this year turning GOP red? Is there a deep-rooted, perhaps unconscious fear about a woman running the country? Can we connect to and hear the feelings of hurt and "left behind" that became an impetus for some Americans to vote for the "change" that Trump proposed? How can I be the most conscious person I can be? How can I listen to others with an open heart and mind? Without judgement and criticism? How can I model courage, authenticity, respect and kindness so that my kids can learn these qualities too? How can I contribute to the overall-health of my community, our country, the world? 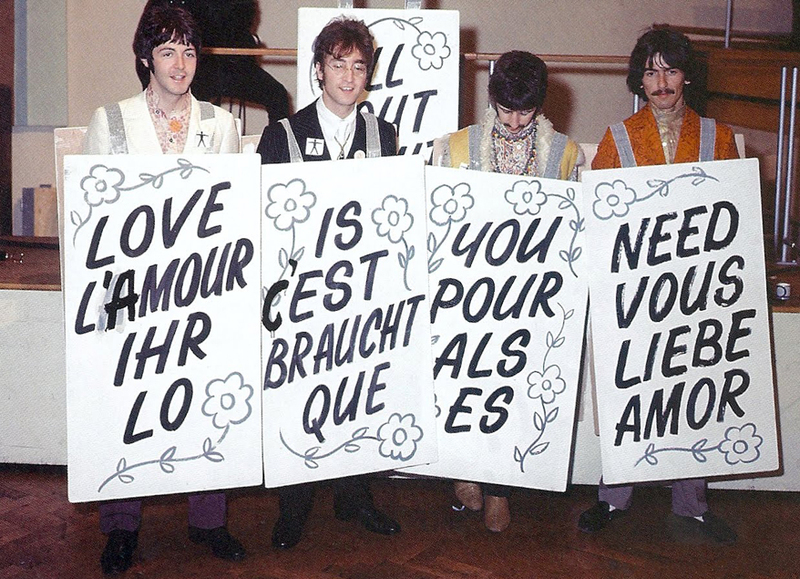 The last two days I have heard over and over in my head the Beatles song, "All You Need is Love." In every culture it resonates and makes sense. 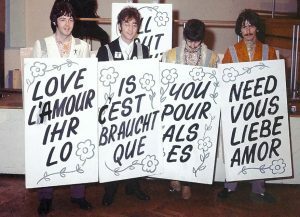 Back in the 60's, the Fab Four held up signs (see above photo) that shouted out "all you need is love" in various languages. Shhh. Can you hear it? Click on the link and it will lift you up, instantly. It really is true. Focus on the love. Be the biggest Love. Love can and will wash through the fears, rage, distrust, sadness and hurt. Love to ask the questions; love to hear the answers; love to understand one another; love to be the best you for the whole country and the world.